This thematic art exhibition combines art, creativity, vitality, memories and blessings together. 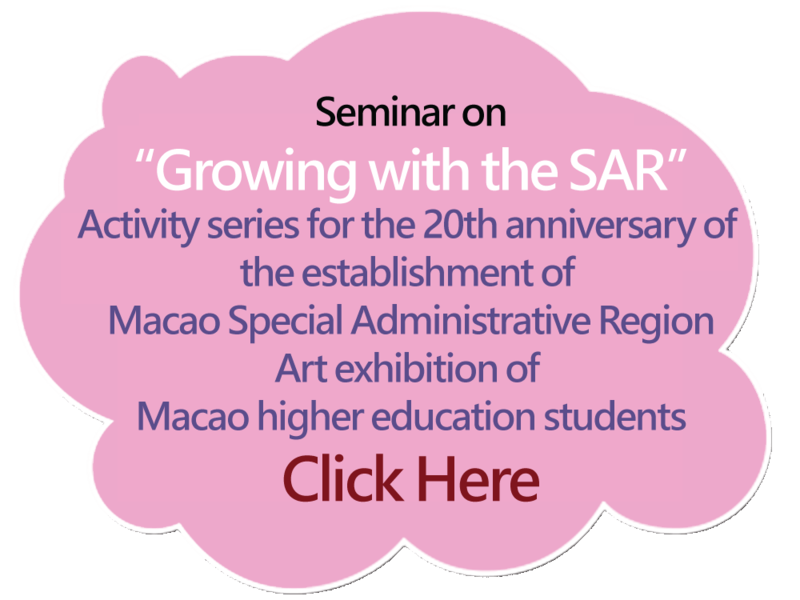 The objectives are to celebrate the 20th anniversary of the establishment of the Macao Special Administrative Region (SAR), and to cultivate the imagination, creativity and team spirit of the higher education students of Macao. At the same time, it is aimed to display the dribs and drabs of the growth of students together with the SAR. The art works will be exhibited to the public to convey the blessings of higher education students to the SAR, and to share the joy of the 20th anniversary of the establishment of Macao. Macao higher education students enrolled in higher education programs in or outside Macao. A professional mentor will be assigned to give advice during the production process. It is not guaranteed that suitable mentors could be assigned for the participating units which choose ‘others’. Download the registration form and fill in the necessary information; together with the required documents, put into a sealed envelope and specify ‘Art exhibition of Macao higher education students ’ on it. Submit the documents to DSES-CEES in person. If there are more than 30 participating units, the professional mentors will do the selection according to the entry categories, designs, feasibility and other aspects. The host reserves the right to decide the final number of participating units. The list of selected units will be announced on the webpage of Student Blog before 22 March, 2019. Selected units will be notified via email. Confirmation must be made before 25 March, 2019. Late reply is not acceptable; replacements will be made by the units on the waiting list. The host will be responsible for all production costs. All works must be completed and submitted to the organizer by 31 August 2019. Mid-term preview: The selected works can be arranged to display in the mid-term preview if they can be completed before 15 June, 2019. Large-scale exhibitions: the selected works will have the opportunity to be exhibited in the large-scale exhibition held in December 2019 in Macau. to be held in December 2019 at the large-scale exhibition. The entries must not contain any obscenity, vulgar language, violence, defamation, nor any commercial activities or propaganda. The participants should ensure that the content does not infringe the intellectual property rights of others. If there is any illegal acts, the host has the right to cancel the eligibility of the participating unit, and retain all rights to pursue and claim compensation. All legal liabilities arisen therefrom will be undertaken by the participating units. Once submitted, the entries will not be returned. The host will have the copyright and the right of use of the works, and may use them in part or in whole for publicity purposes including publishing, displaying, broadcasting, promoting, uploading to the Internet or for other public educational purposes without notifying the participating units in advance. For publicity purposes in the future, the host will arrange a filming crew to take videos and conduct interviews during the production period. For any disagreement, please submit objection in accordance to the Article 12 of the Law No. 8/2005 ‘Law on the Protection of Personal Data’ . Higher Education Bureau reserves the right to explain the prospectus. Go to Wechat and click “Discover” at the bottom. Use “Scan QR Code” to share this website to your Wechat Moments.